Global Village is an annual exhibition that takes place in the United Arab Emirates during the winter months. The main attractions are country themed pavilions from around the world that offer local products and food, though there is also a substantial funfair at the southern boundary of the site. Between late 2014 and early 2017 this area was subcontracted to the UK-based Mellors Group, who brought in a wide variety of travelling rides, notably the powered Runaway Train that once operated at American Adventure. 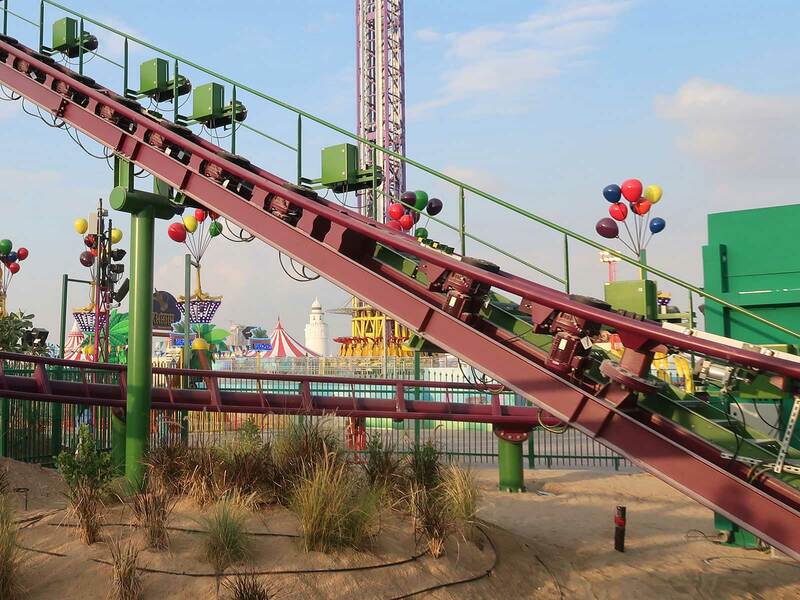 Though the deal was undoubtedly successful for all parties management decided against renewing the contract for this year; instead, they have brought in a new operator with a selection of permanently installed machines including a brand new roller coaster. London Loop (#2397) is the fourth version of the "Rebound" Family Boomerang and the third to open this year. The hardware was apparently completed just days before the start of the event, which might explain why the station building looks both spartan and temporary; the walls lack even basic theming, and the sheet metal on the roof looks like it would be blown away by a good dust storm. That being said, some effort has been made to spruce things up; the ceiling has two strips of colour changing lights, and the reverse lift hill and station have a variety of different soundtracks available. For our first lap we had a 5-4-3-2-1 countdown before the initial drop, which switched to a bilingual "get ready" for laps two and three. The main portion of the layout circles an artificial sand dune with small sprigs of plant life poking through in places. In common with most new-generation Vekoma rides the train negotiates it without even the faintest hint of jarring. The back had a slight edge over the front for me, but there wasn't a lot of difference either way; the experience in both ends of the train was excellent. The only slight negative tonight was an extreme loose object policy; everything had to go into a cubby hole, including items from zipped pockets and secured glasses. On the positive side, it was a treat to finally enjoy one of these rides in relatively pleasant weather after pouring rain at Paultons Park and freezing temperatures at Energylandia. There was a similarly strict loose object policy in effect on Shanghigh, an eighty metre high portable Funtime Star Flyer with two seats on the end of each chain. The ride looks like it may have begun life on the European fair circuit, but regardless of provenance the installation is clearly not going anywhere in the near future, as both the entry and exit gates have been concreted into place and new mouldings for the seats carry the Global Village branding. Though I'm normally a fan of this type of ride the experience was weakened considerably by the fact that my glasses were at ground level. That being said, the cool breeze at the heights made for a pleasant break from the heat of the afternoon even if there was a vague hint of sand in the air. There were no other attractions of interest to me, though Megan wanted to experience Fly France, the first and only Gerstlauer Sky Fly in the Middle East. On her first attempt she managed to rock her car from side to side while the nine locals on board sat resolutely upright, much to the amusement of the operators and passers-by, but this wasn't good enough for her. On round two, she figured out how to get the car to flip, and ended up achieving over twenty inversions during a relatively short ride cycle, something that my uncooperative stomach would never have been able to cope with. On my last visit to the Khalidiyah Mall back in 2011 we found ourselves requisitioning a number of park staff to join us on the Roller Coaster so that there would be enough weight in the train to allow it to complete the course. Despite the full load we still came close to stalling, suggesting that the original engineers may have gotten their energy loss calculations wrong. Since then the track has been retrofitted with a pair of booster wheels, and though these are far from elegant they nevertheless add just enough speed to solve the problem. Even with this fix however there was a definite sense that we were enjoying a coaster on borrowed time. Today the train was making it up the lift hill without assistance, but it was a close run thing; on more than one occasion we saw operators giving it a push, and the the arthritic drive mechanism was making a rather unhappy squeaking noise. Once at the apex we clattered our way around a slow descending helix and some side-to-side turns, followed by the boosters and a final turn back to the station taken at a fast walking pace. (One circuit would have been ample for us, but the cheapest ticket we could buy was 75 DHS, covering us for two rides apiece. We ended up in the back seat on both occasions, though the experience was likely no different in the front).